It might be the last day of Fall KCW 2013, but I still have a few pieces to show here. I changed my initial (blogging) plans and instead of showing the pieces by the order they were completed, I will show you today the last one. Well, because we had a weeding yesterday and every single spare minute of the Fall KCW 2013 week was used to sew a flower dress (and a last minute cape). There are quite a few good patterns I could have used for this dress (Oliver+S, Scientific Seamstress, The Cottage Mama, Children’s Corner and The Straight Grain all have great versions that I’ve tested before and that could be easily adapted for a similar dress), but I decided to go for a self-drafted version: It’s a simple bodice with hidden button closure in the back, a full skirt and a large sash. 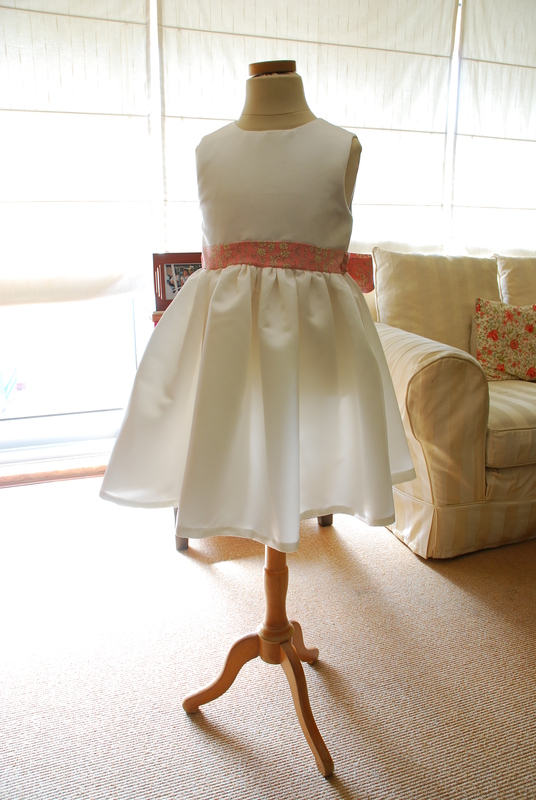 I used a beautiful satin fabric (n iivory) for the dress. As, the bride didn’t have any special request for the flower girl dress, I was able to pick a favorite Liberty print for my stock (Liberty Capel in baby pink). The bow is definitely my favorite part of the dress and if I had enough time I’m pretty sure I would have done matching ties for my boys (this time, they were quite happy for my lack of time. They weren’t very keen wearing baby pink ties). Despite the weather forecast, the days before the weeding it rained so much that I began to questioned my judgement (after all, it was a sleeveless dress for an outdoor wedding) so I decided to made her a cape (just in case). I had just the right fabric in my stash (from a stock off sale, last year) and I had a pretty good feeling about a much-postpone pattern – The red riding Hood Cape from Oliver+S Little Things to Sew book. I can’t rave enough about this pattern – it took me less than 1-hour from start to finish and it was so easy to put together. Perfect for beginners. I did make some minor alterations because I didn’t have enough fabric: I selected the larger size but reduced the length by 2 inches and used the smaller size for the hood. 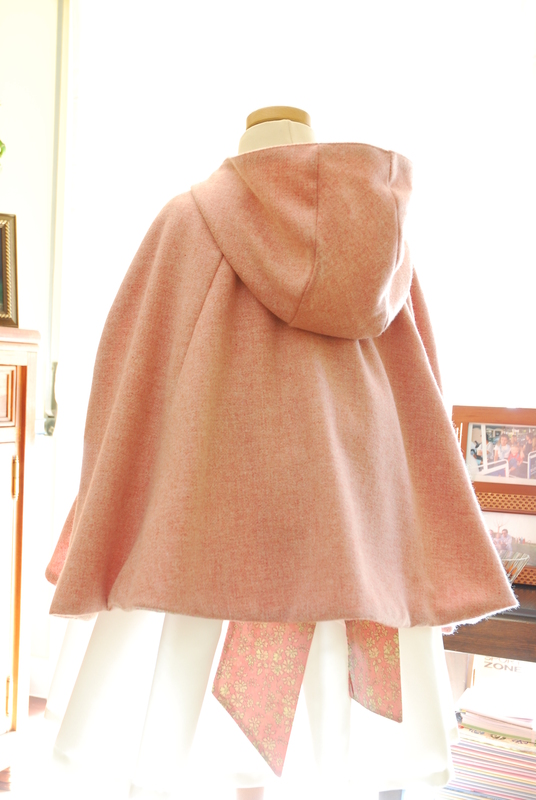 The cape is made from a soft cashmere/wool blend and lined with a pretty pink floral (not Liberty, as I couldn’t bear myself to use Liberty for the lining. Sorry!) and it closes with a small wood button from my collection. (Fortunately) during the wedding the weather was sunny (! ), so she only wore the cape when the daylight was gone. It was a major success and the perfect compliment for the dress. Just for the record, this was how the dress looked like 5 minutes after the end of the ceremony (notice the big stain in the front bodice). Trust me, you don’t want to see how it looked when the wedding ended (after midnight). I can assure you that there are enough stains to keep me busy for a while. (she did had another dress but, as expected, refused to take this one off). Oh well, at least this girl likes to party (she was the last person on the dance floor and didn’t want to leave …). See you tomorrow for another Fall KCW 2013 project? What a darling dress. I bet it fit the bill beautifully! The dress is cute but I LOVE the cape! What kind of fabric is it? Hard to tell from the photos. The color is stunning though! Thank you Sara! 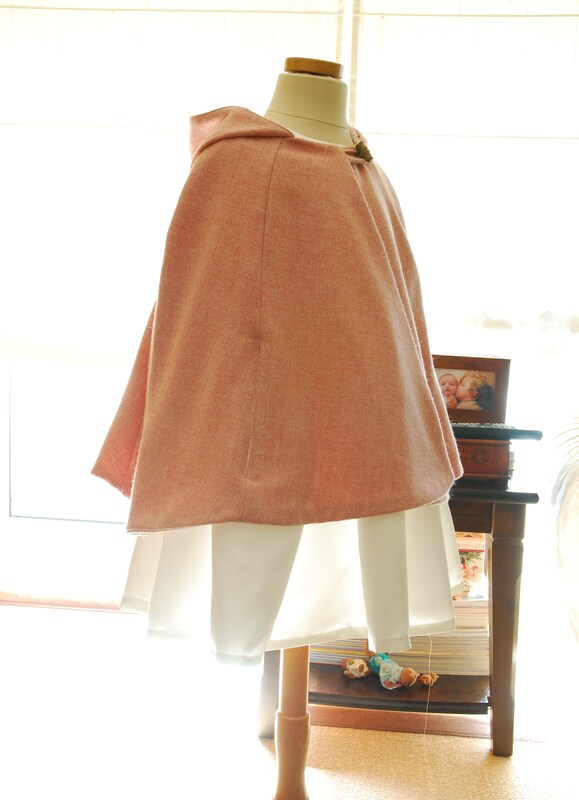 The cape fabric is a wool/cashmere blend (baby pink) that I got from a stock off sale last years (I think). It’s light, soft and still very warm – she only wore it after the party ended (because it was already dark and cold) and she love it (like everyone else did). 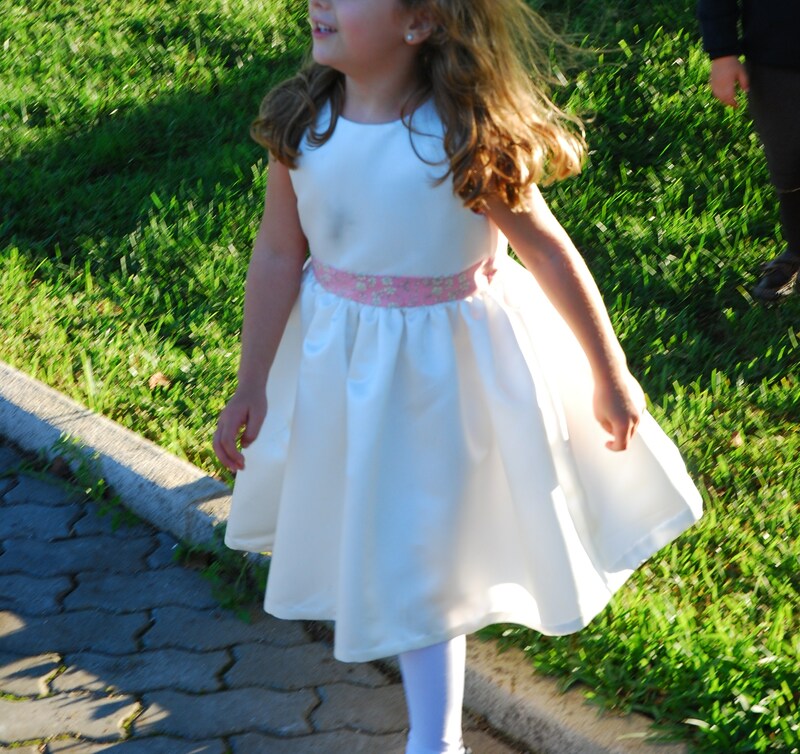 What a lovely “flower girl” dress highlighted with a white-tiny-flowers-on-pink-background wide sash…and a pink cape! MY, you were BUSY sewing for your daughter. SIMPLE and lovely, INDEED! Looks perfect for the wedding party. Thank you so much Sarah for the lovely comment! 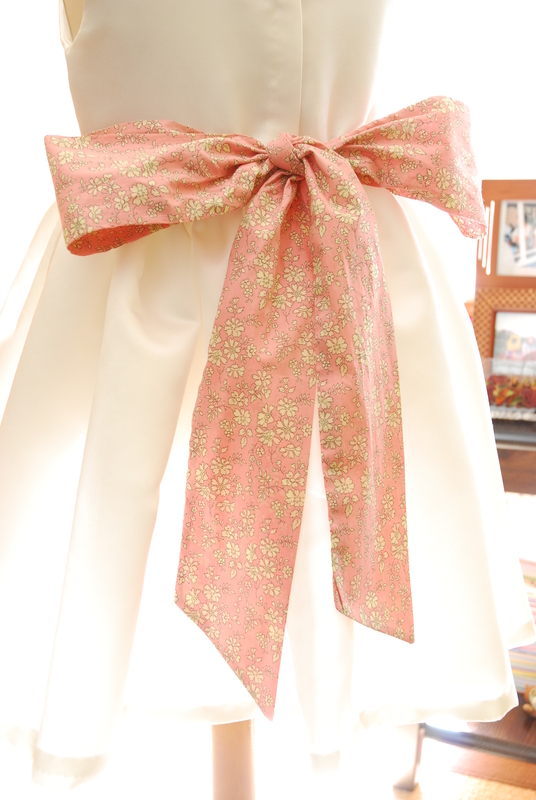 I do wish I had more time for sewing – sometimes it’s such a rush and I do enjoy taking time with the “small details”. Such a pretty little dress and I love that you made the cape too! Lovely. Perfection, you clever clever girl. 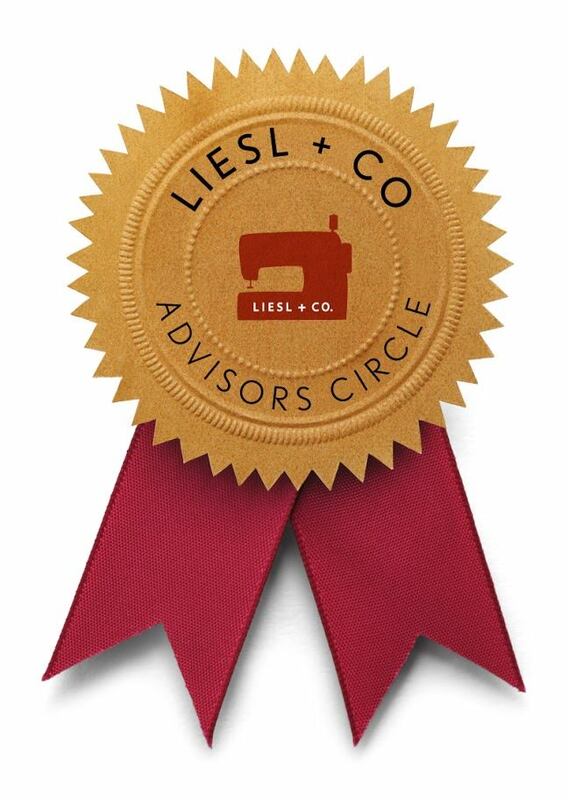 Everything you sew is more lovely then the last. Oh I think that’s the loveliest red Riding Hood cape I’ve seen, and I thought that even before I read the words wool/cashmere blend! Tenho a certeza que a “Miss M” era a mais gira (e bem vestida) da festa! O vestido ficou amoroso e parece primorosamente bem feito, como sempre! How adorable! I just love the cape! This is so very lovely! I don’t know how I missed it before.